Why we need to talk about Shanelle Cartwright's refusal to vaccinate. Why we need to talk about Shanelle Cartwright's refusal to vaccinate her children. These are the uncomfortable words of Sydney paediatrician Dr Scott Dunlop. 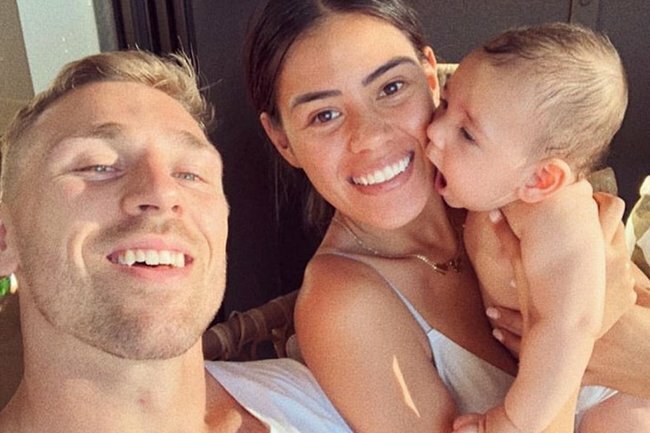 Earlier this week Shanelle Cartwright – wife of NRL football star Bryce Cartwright – went public via social media to her more than 7000 followers about her decision to not vaccinate her children. 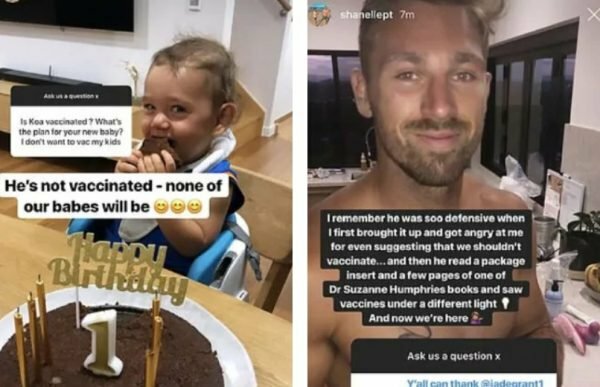 The 20-year-old told her following, via an Instagram Q&A, that she and her husband had done a lot of research, and despite his resistance at first - it was one book, by a prominent anti-vax supporter that ultimately changed their opinion. Her comments made headlines across Australia, but almost immediately, people started to debate whether the story should have even been reported in the first place. Does publishing a person&apos;s views in the public domain give legitimacy to them? Does it suggest that all opinions are created equal? Or is it necessary to shine a light on comments like Cartwright&apos;s, so they can be interrogated? “Unfortunately many women (and no doubt men) who follow these [influencers] do actually listen to what they have to say," said Dr Dunlop. “The anti-vax movement is just that - an ideological movement that has no basis in evidence, and really involves a minority of the population." The Australian Government highly recommends all children are vaccinated. With programs such as “No Jab, No Play” implemented around the country, state governments have made the importance of vaccinations known in Australian preschools and schools. But no matter how many doctors, experts or government organisations lay out the facts, there is a small minority of Australians who refuse to listen. Former Prime Minister Malcolm Turnbull talking about the dangers of not vaccinating. Post continues after video. The news of Cartwright&apos;s comments left Dr Keang-Sing Lim, who is a Sydney based GP, frustrated. “Someone not vaccinating, is someone not being a team player,” he said. “It does [scare me]. This is something we see everyday [non-experts giving advice]. “In my practice almost everyday I get someone asking me about something they’ve read on the internet, or something they’ve heard a friend tell them. “I am actually very pleased when someone asks me, because it allows me to have that discussion with them, I am more concerned by someone who reads this information [online] and does not seek more information,” said Dr Lim. 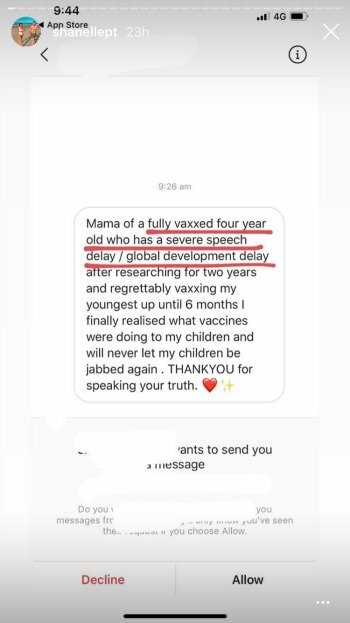 Perhaps this is why it&apos;s important we talk about - rather than entirely ignore - Shanelle Cartwright&apos;s refusal to vaccinate her children. Because ignorance thrives in silence. And because Cartwright&apos;s decision isn&apos;t just a harmless personal choice. It&apos;s dangerous, and it has very real consequences. Late last year, the World Health Organisation confirmed that the anti-vax movement has prompted a 30 per cent jump in measles cases worldwide. Views like Cartwright&apos;s impact people&apos;s health and people&apos;s lives, which is a conversation we can&apos;t have if words like Cartwright&apos;s are sitting, quietly, on an Instagram story that no one questions. Since sharing her opinion online, Shanelle has been inundated with messages supporting her and telling her “horror stories” about vaccinations. She has shared upwards of 20 on her Instagram stories, leaving doctors flabbergasted. Doctors are terrified by the messages Shanelle is sharing after her anti-vax message. “The problem is that there is a lack of accountability for anti-vaxxers who promote pseudoscience and engage in fear-mongering,” said Dr Tony Bartone, another doctor - who also happens to be President of the Australian Medical Association. “They often target vulnerable parents and, unlike doctors, they do not see the consequences of non-vaccination and undermining herd immunity,” he said. “We are not routinely confronted with death and disability caused by vaccine-preventable disease. Many people have not seen wards with patients relying on iron lungs due to paralysis caused by polio. “Perhaps the success of the National Immunisation Program has allowed sceptics or anti-vaxxers to flourish?” he questioned. We don&apos;t let hard facts about human health become a matter of opinion - for one. For every question he is routinely asked about vaccination, Dr Lim has answers. “I can back all of those questions with scientific answers,” said Dr Lim. “Lot of studies look at the rate of autism between those who have been vaccinated and those who haven’t. The rate is the same. Vaccination DOES NOT increase rates of autism,” he concluded. Paediatrician Dr Scott Dunlop is determined to help parents block out the endless parenting "noise” around them - because he is scared the tide is turning. Dr Dunlop is so fearful, he has created a closed Facebook group called "Kids Consult" to help steer parents in the right direction. “Even though they are thankfully a minority [anti-vaxxers] there is no doubt that in my clinical practice there are more un-immunised children than there were 10 years ago,” he warned. “In most cases, those that do choose not to immunise are rarely open to the idea of even a discussion around it, and listening to the evidence for and against,” he said. “The obvious danger of these [social media] views being heard is that they take hold in even a small way, and the population suffers as a result of decreased herd immunity," said Dr Dunlop. Despite an increased trend in Dr Dunlop’s clinic, the AMA insists on the whole - Australia has a good immunisation record. In New South Wales, Victoria, Queensland and Western Australia, unvaccinated children are banned from enrolling in preschool. Approximately one to two per cent of parents in NSW refuse to vaccinate their children. The latest figures show that overall, more than 94 percent of one-year-olds and five-year-olds are fully immunised. “It comes down to the fact vaccination works when more people in the community are vaccinated.